I guess you can’t really call it a seawall if it’s on the edge of a lake but for lack of a better term that’s what I call it. I sketched this with my upcoming workshop in Kamouraska in mind. I think we will probably have lots of little views like this along the St. Laurent and I wanted to get in a bit of practice with water, rocks and shoreline. Only the teacher needs to practice!!! Wow! the water just amazing! This is so beautiful and has such a sunny atmosphere! We have hardly seen the sun here in Switzerland since October at least, it’s been the darkest winter and spring in over three decades and it’s no fun to paint outside at all. I am officially jealous. And I am counting the days to the BCN symposium! That sounds awful. Glad I didn’t plan a workshop in Switzerland. I am counting the days to Barcelona too. We are pretty much guaranteed sun, right? I love the light and perspective. 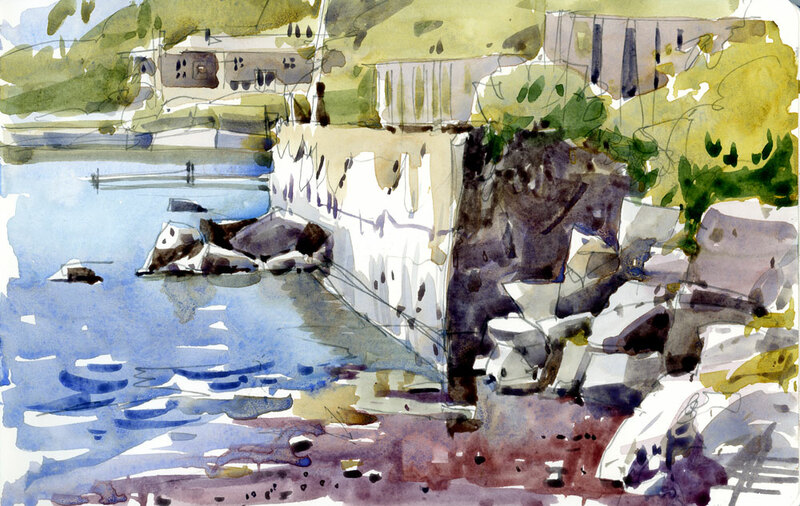 You managed to make something heavy and immobile (sea wall) into this lovely, light and fresh painting. Brilliant! Thanks so much Anita! I think I will have to turn this sketch into a bigger painting sometime soon. I am enviuos! You make working with water colors look so easy. It may seem like that but it is a constant struggle!